Pan Lydstudio's telefonnummer er 63 84 33 30 og fax nummer 63 84 49 70. All our products carry a five-year parts and labour guarantee. The acronym `MIDI' stands for Musical Instrument Digital Interface. 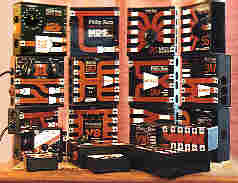 Synthesizers, home keyboards, sampling instruments, drum machines, personal computers, sequencers and a wide range of related equipment are now fitted with this industry standard interface. The main use of MIDI is as the electronic pathway through which information flows from the performer's actions, by the agency of a MIDI controller instrument, to the MIDI-equipped sound generating devices which render the performance. The information transferred by MIDI primarily relates to musical events - such as the start and end of notes played and movement of the pitchbend wheel. The events are described by MIDI messages, which are a sequence (serial datastream) of digital electronic switching states or bits. These bits are conceptually organised into groups of eight, which are called bytes. A MIDI message may consist of one or more bytes. Important MIDI messages such as note-on and note-off are made up of three bytes each. The MIDI standard also incorporates two systems for synchronisation. The first system is tempo-relative and is called System Real Time. The second system is based on absolute timing in hours, minutes, seconds and frames; this system is called MIDI Time Code, and is related to the SMPTE timecode standard as used with audio and video tape recorders. Those familiar with computer interface standards may like to know the following. MIDI is an asynchronous, byte-oriented, serial interface running at 31.25 kbaud. It uses a 5mA current loop, which is in the off state for a mark and uses one start bit, one stop bit and no parity. All drivers are active and all inputs are passive and floating (opto-isolated). The MIDI hardware standard specifies MIDI input and output connections, called MIDI ports. The MIDI ports use five-pin 180° DIN sockets. The MIDI standard also describes the MIDI cable, using five-pin 180° DIN plugs, to suit the MIDI ports. There are three types of MIDI ports called MIDI In, MIDI Out, and MIDI Thru. A MIDI device receives MIDI messages via its MIDI In port. It may provide a duplicate of the MIDI datastream arriving at its MIDI In port via a MIDI Thru port; This means that the received MIDI messages can be passed on to the MIDI In port of another MIDI device. MIDI messages generated by the device itself are transmitted via a MIDI Out port. MIDI also defines a standard format for musical computer files, where sequences of musical events are encoded in a format related to the MIDI communications protocol. The MIDI standard is managed by the MIDI Manufacturers Association. The following boring paragraphs make some key references to our range of MIDI accessories, including MIDI merge, MIDI thru and MIDI sync units. For more detailed descriptions of our MIDI accessories, follow the links. The MIDI merge units merge MIDI datastreams, several MIDI inputs are combined into a MIDI output, certain of our MIDI merge units also have MIDI thru ports. Our MIDI merge units can handle all types of MIDI message and they provide the best MIDI merge function available anywhere. The SMPTE/FSKplus MIDI tape sync unit, TS1, will synchronize a MIDI sequencer to a tape recorder audio track via SMPTE timecode and MTC (MIDI timecode, the MIDI relation of SMPTE) or via FSKplus (our proprietary version of SmartSync or Smart FSK or similar) and MIDI Song Position Pointer plus MIDI clocks. The MIDI line drivers enable MIDI signals to be sent down long distance cable runs. The Advanced Programmable MIDI Foot controller can generate and process all kinds of MIDI messages. The MIDI Selectors are MIDI switch-in-a-box products, which will route your MIDI connections, and sort out many MIDI routing problems. The MIDI sync interface MDS converts MIDI clocks to Sync 24 (Sync24 or Roland type DIN sync) pulse train and control signals. The MIDI to CV converter Little MCV converts MIDI note-on and MIDI note-off messages to CV and gate analog (analogue) control signals. This will let a MIDI system control old-fashioned monophonic synths (monosynths or synthesizers). This MIDI to CV converter also responds to MIDI pitchbend, MIDI mod wheel (modulation, LFO), MIDI portamento, MIDI hold and MIDI sustain messages. Our MIDI hardware will help you make electronic or computer music and use MIDI. This site contains product descriptions of our MIDI electronic and computer music devices. Profesjonelt lydstudio. CD-opptak og produksjon. Salg av keyboards, Hammond & Leslier, musikk & data-utstyr, software, nytt og brukt musikkutstyr. Utleie og reparasjoner.